The Cowardly and Lame Duck City Council of 2007-2011 on Thursday presented Highwoods Properties, owner of the Country Club Plaza, with a plump, belated Easter egg. If the rezoning of the Neptune Apartments at 46th Terrace and Broadway stands, paving the way for an eight-story office building, it’s probably going to generate hundreds of millions of dollars for Highwoods over a period of 20 years or so. The whole thing left me feeling empty and blue. I think that with the council now having opened the door for construction of a high-rise office building east of Broadway, Highwoods will seek to continue the commercial march right on down — or behind — 47th, perhaps all the way to J.C. Nichols Parkway, where Commerce Bank and P.F. Chang’s are located. The opponents, a group called Friends of the Plaza, still have a chance to defeat the rezoning, if they can mount a successful initiative petition and then defeat the measure at the polls. To force an election, the opponents need the signatures of at least 7,144 registered voters — a number equal to 10 percent of the number of people who voted in the March 22 mayoral election. They now have nine days to file a notice of petition with the city clerk, and then they will have 30 days before they have to submit their first round of signatures. After that, they will have an additional 10 days to gather more signatures. I said in Wednesday’s post that I thought such a petition and ensuing vote would be successful, but after what I saw and heard Thursday, I think the opponents are bucking strong head winds. More on that in a minute. Thursday’s rezoning took two actions. The first was passage of a resolution amending the 1989 Plaza Urban Design and Development Plan, which essentially limits commercial development to the west and northwest parts of the Plaza. The council approved that on an 8-3 vote. The second was passage of an ordinance rezoning the Neptune site from residential to commercial. That also passed on an 8-3 vote. Voting yes were Deb Hermann, Bill Skaggs, Ed Ford, Russ Johnson, Melba Curls, Jan Marcason, Cindy Circo and Terry Riley. Voting no, besides Funkhouser, were John Sharp and Cathy Jolly. Opponents had expected Jolly to vote “yes,” and if that was her intention, she was the only person the opponents were able to swing around. Fourth District at-large Councilwoman Beth Gottstein “recused” herself because her fiance, a physician, has an office on the Plaza. Third District Councilwoman Sharon Sanders Brooks also recused herself but didn’t say why. Both are outgoing council members. 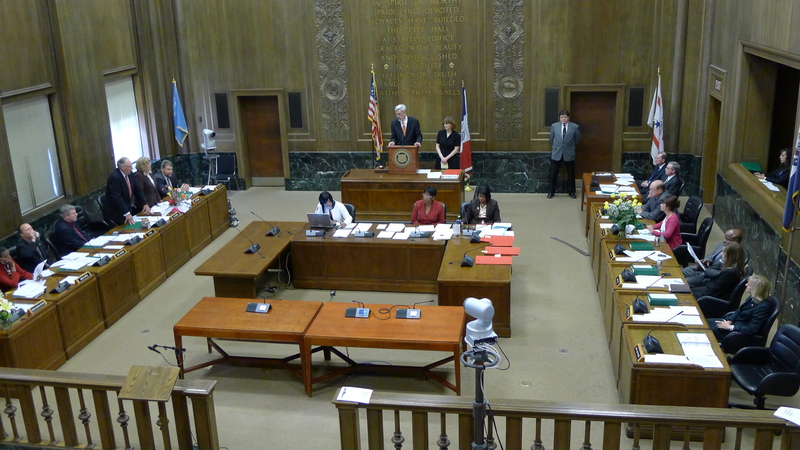 The council acted three days before its term concludes. 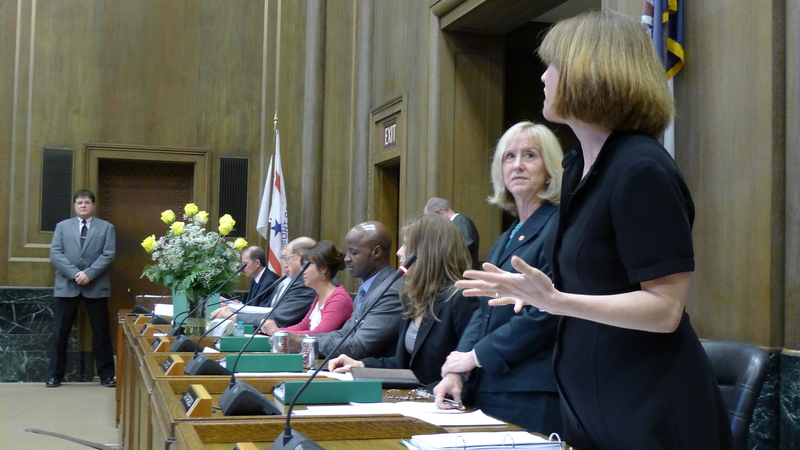 The new council, which includes seven new members, will be sworn in Sunday. Highwoods, based in North Carolina, has been paving the way and anticipating this outcome for months. The firm has stopped renewing leases for residents of the Neptune, which are slated to be razed. The apartments could be empty within a couple of months. Highwoods has a prospective tenant in mind, the Polsinelli Shughart law firm, which is currently housed a block or two west of Broadway. However, Polsinelli Shughart said on April 4 that it was dropping plans to inhabit a new building on the Neptune site because it has to be out of its current offices by the fall of 2013. In light of the possible referendum, the new building probably can’t be completed by then. And Highwoods cannot proceed until the matter is finally resolved. The reason that Thursday’s approval was such a fat egg for Highwoods, however, is that if the ordinance stands, Highwoods can recruit another tenant and proceed with the Polsinelli Shughart plan, even if Polsinelli Shughart does not go into the building. Council reconsideration is not needed as long as the plan stays the same. And Highwoods should have no problem lining up another tenant, mainly because the Neptune site comes with 468 additional Easter eggs — ready-made, mostly below-ground parking spaces. The parking structure — the first Tax Increment Financing project in Kansas City — extends from the Neptune all the way over to Wornall, behind Houston’s restaurant. The fact that the council rammed through the rezoning with Polsinelli possibly out of the picture was particularly galling to the opponents. “There was no need to rush this through on the last (meeting) day of the council,” said Vicki Noteis, a paid adviser to Friends of the Plaza. Now, about that initiative petition and possible referendum. First, the Plaza is not the go-to place that it once was for many area residents. With the contraction of the urban core and expansion of the suburbs in recent decades, fewer local residents patronize the Plaza regularly. They go, instead, to places like Zona Rosa and Briarcliff Village (north), Independence Center (east), the Legends (west) and Oak Park Mall (south). Consequently, the Plaza is not as near and dear to as many people as it once was, which means that, come election time, support for overturning the rezoning is likely to be concentrated in the Fourth District. That’s not a scenario for a citywide victory. Second, the opponents’ ranks seem to be thinning and their will ebbing. By the time the rezoning came up for a vote Thursday, only about 50 to 75 opponents were left in the 26th floor council chamber. That’s not enough to scare a council that has made up its collective mind; it takes busloads of raucous, angry opponents. Frankly, the opponents looked more resigned than angry. 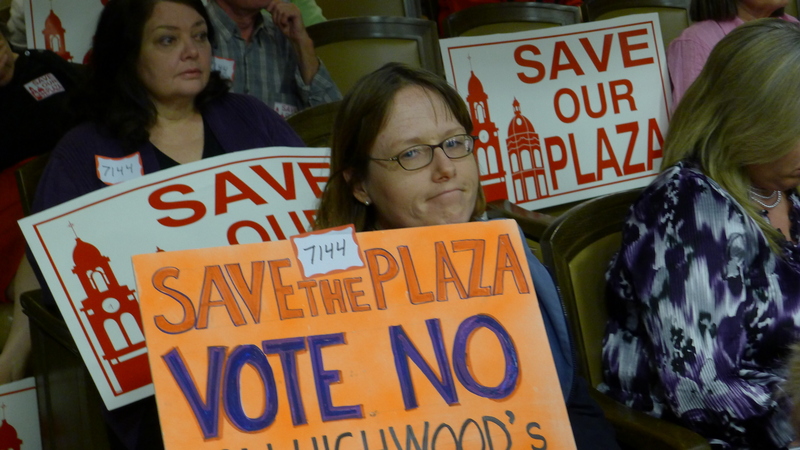 After the first, telling vote, they put down their “Save Our Plaza” signs and quietly filed out. Why are they down? Well, the battle has gone on for months; the building plan has been revised twice, thinning the ranks of the opponents with each revision; and Polsinelli Shughart’s announcement that it was dropping out lulled at least some of the opponents into a false sense of security, as Highwoods played possum. Third, Highwoods has time and money on its side. Highwoods wants more density on the Plaza. That means more tall office buildings and fewer low-level retail stores. They’re shelling out probably millions of dollars to lawyers (Husch Blackwell) and others to get their way. Commercial development and office leasing is their bread and butter nationwide, and they’re dug in for the long haul. It’s no fun watching the Yankees win, is it?